It was over a year ago when I decided I wanted to make a quilt for my friend, Brian, who lost is home in Colorado’s Waldo Canyon Fire. 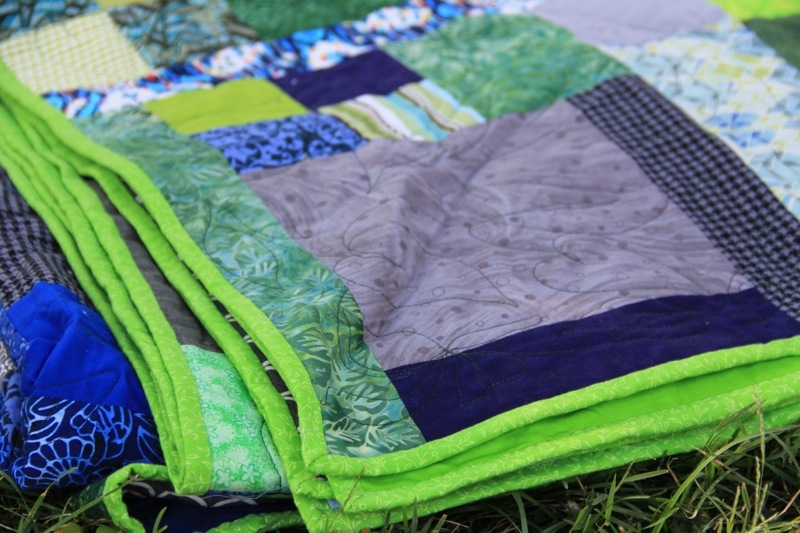 My goal was to finish the quilt as a house-warming gift when he rebuilt his house. Brian moved into his home in April. 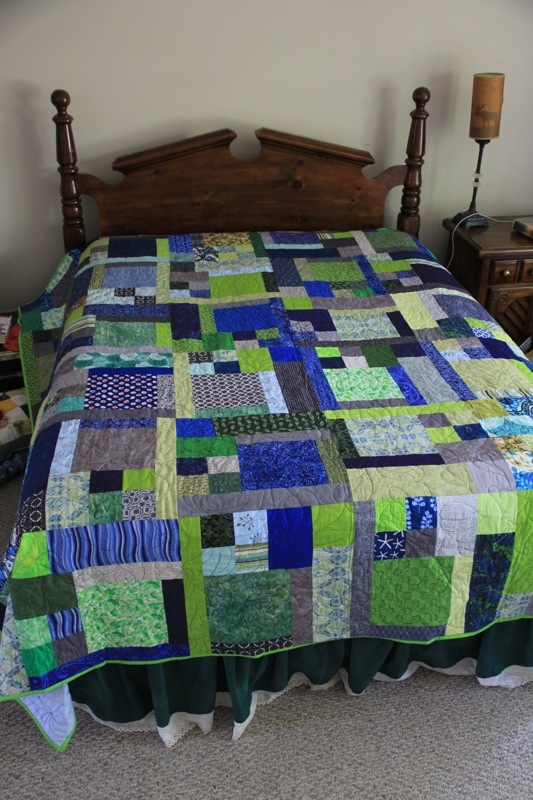 The quilt was finished in May. But it still had to be bound, and we were moving, so my mom took the quilt to put the binding on. She brought it back when we moved in to our new house in August, and then it’s just hung out here since then. No excuses about why I didn’t mail it until last week. 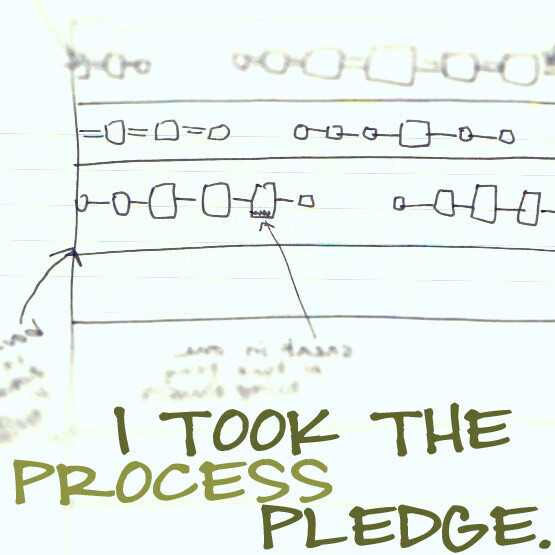 But Brian has it now, so I will show you. Brian is an outdoor guy who lives in the mountains of Colorado, and that’s what inspired the color palate of grays, greens and blues. My original plan was 6×7 16-inch squares, but that size turned out to be way larger in reality than I imagined, so I stopped at 6×6. I made about half of the blocks, and I had some help with the rest. My mom, who has known Brian as long as I have, made some, as did another friend, who has also known Brian since childhood (hi Monica!). 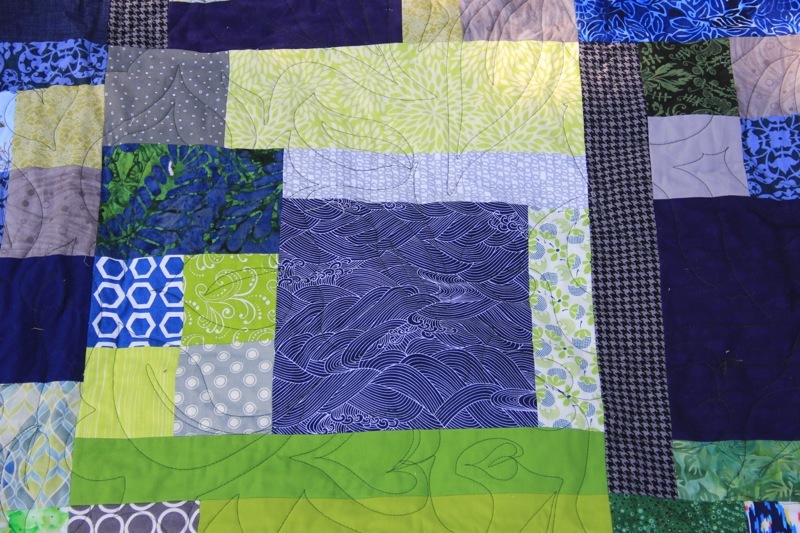 I requested some blocks from Flickr friends, and so this quilt includes the loving work of people around the country and around the world. 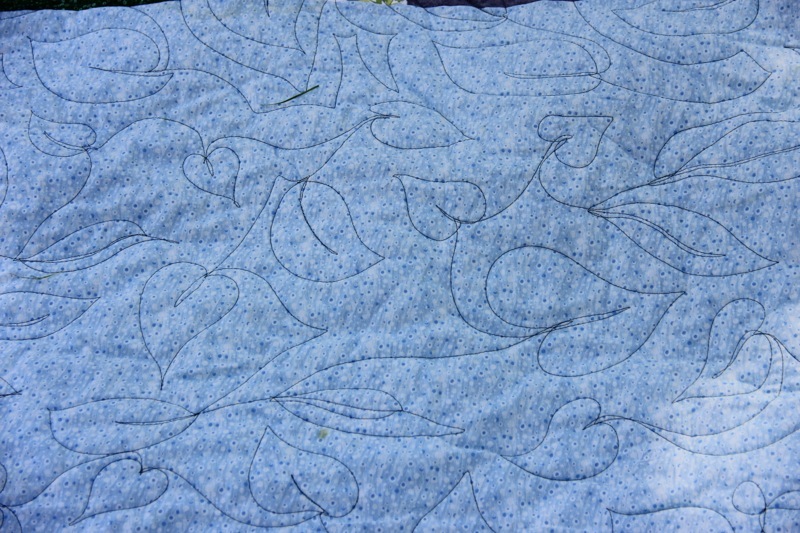 The back of the quilt has blocks I didn’t use on the front, and a collection of the leftover fabric pieced together. A friend in Virginia volunteered to quilt this for me, and I am eternally grateful to her because I don’t know how I would have gotten this 96 x 96 inch beast through my home machine. 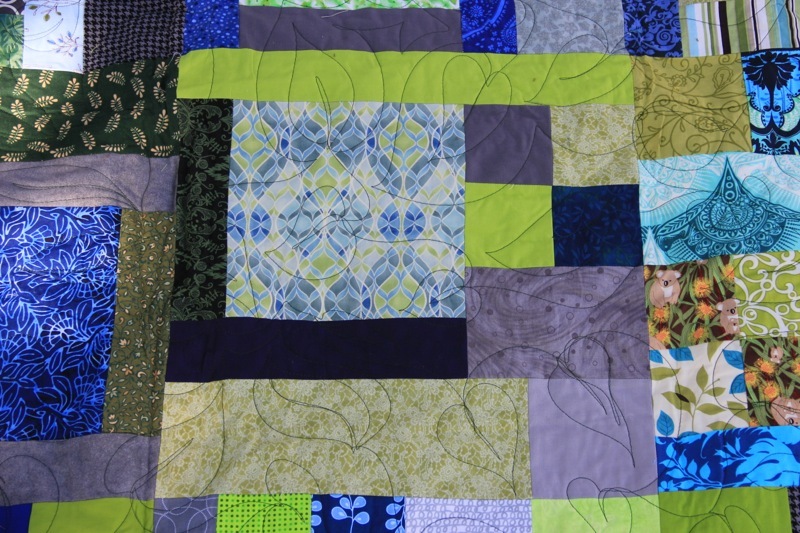 She used an all-over freeform leaf pattern, which fits nicely with the color theme of the quilt. The binding is a nice saturated green. Thank Goodness It’s Finished Friday. Very nice. I really like the colors. Especially the greens. I love those colours! You need a TGIFF link in the post to be in the prize draw this month though! Don’t miss out! It’s really good and a beautiful story behind it too! Yay! A wonderful gift to give a friend in need! Way to go, Em! Congratulations, it’s gorgeous. 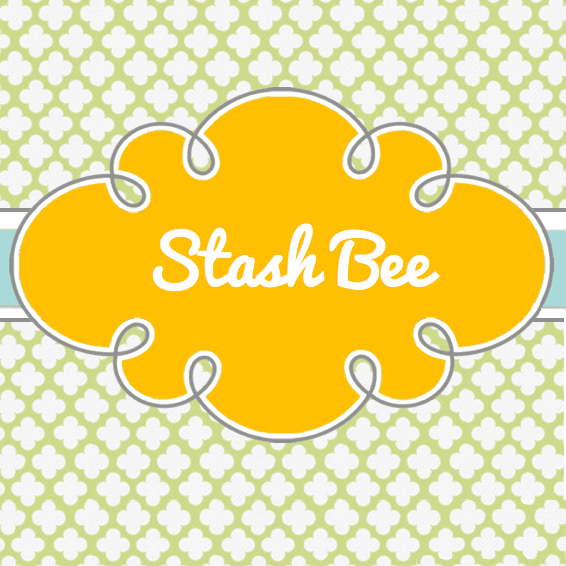 The quilting pattern is a fantastic complement to your design. 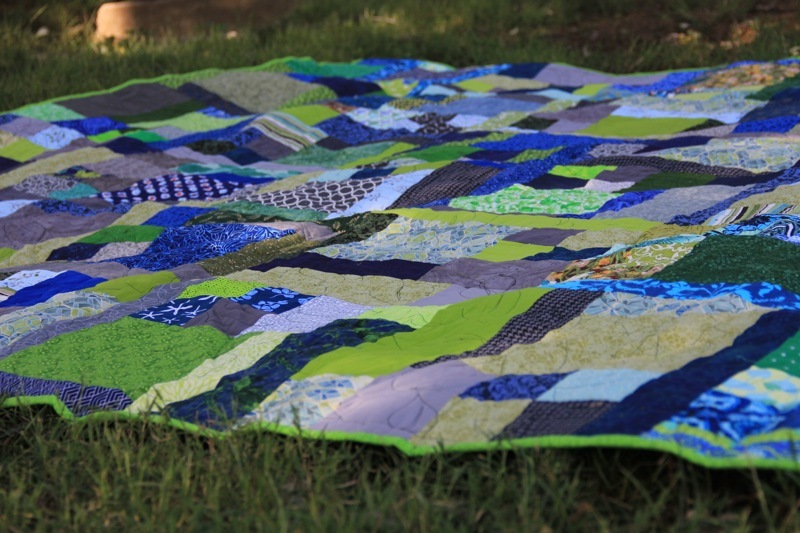 what a beautiful quilt, and such a special gift that I know your friend will cherish! 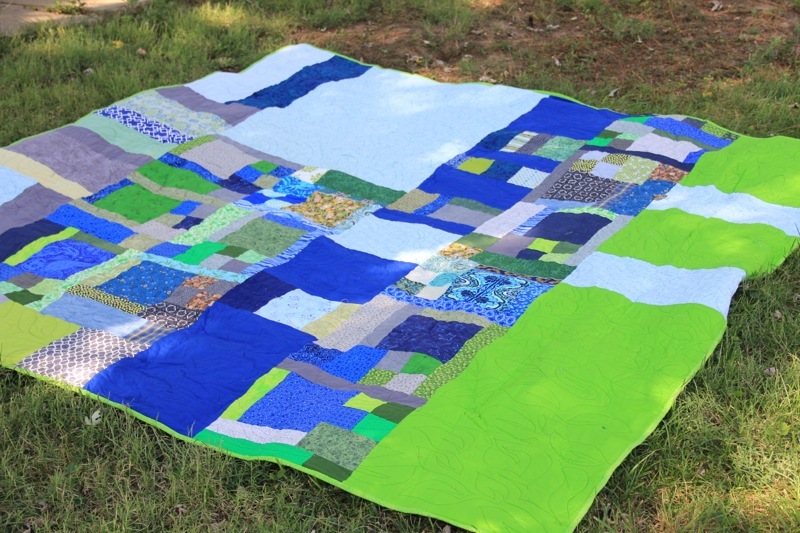 Love the colours used in your quilt! I find the blues just pop. Oh! 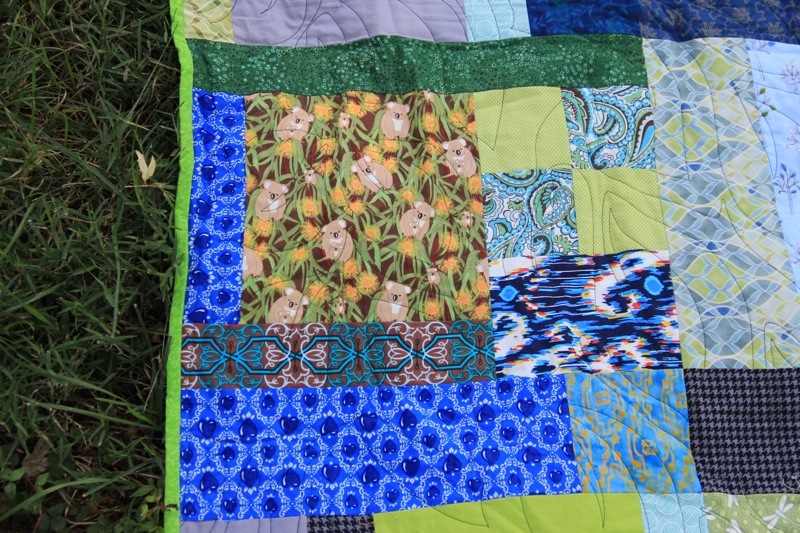 This quilt is so friendly and happy. What a lovely gift to give your friend! I have friends and family in Colorado, and while none thankfully lost their homes, it was scary! And then, the flooding…wow. They just can’t seem to catch a break! Congrats on your beautiful finish. Love the colors. 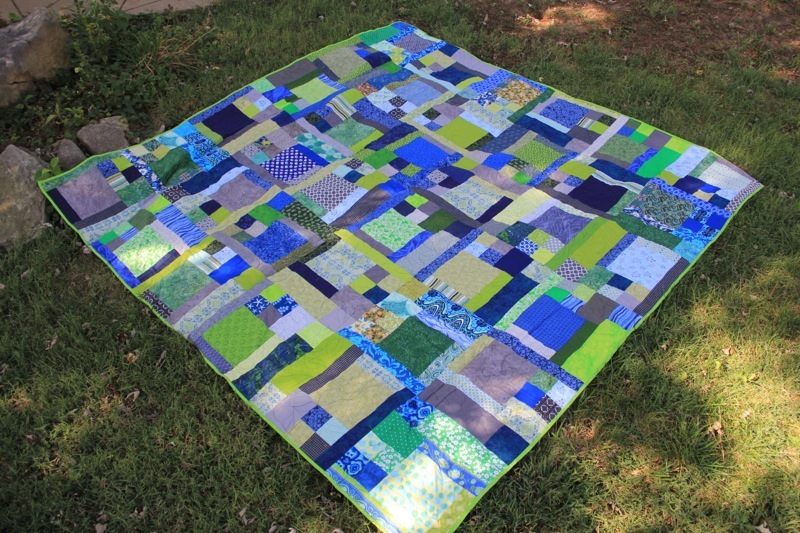 The colors look like the quilt I posted to today (Bonnie Hunter’s Easy Street pattern). Lucky Brian!